From the gym to school pick-up in T-10 minutes? Back to back meetings with hardly enough time to pee, nevermind eat? Lifemin taking over your weekends? Sound familiar? Time-crunched days are stressful enough without trying to build in quality meals, so sometimes we need a little help to get us from A to B (or from breakfast to lunch and lunch to dinner). 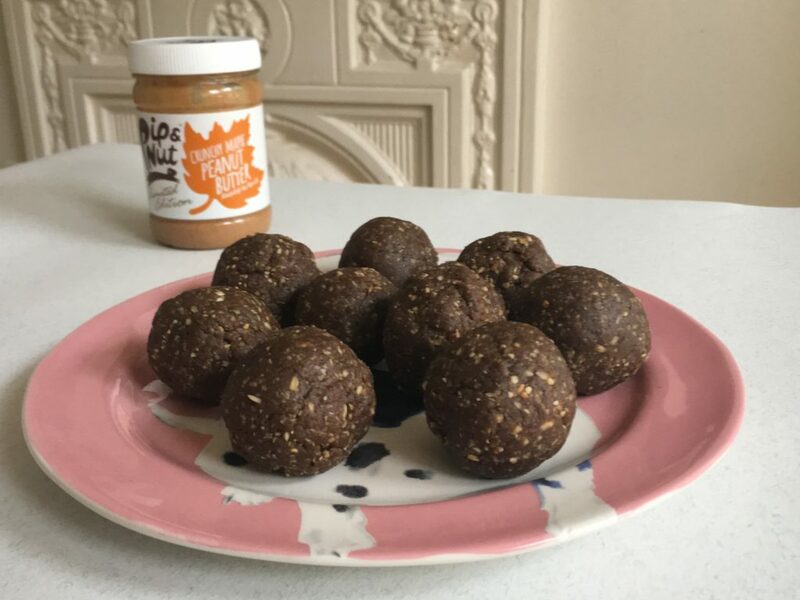 Here’s a quick protein ball recipe I whip up on Sunday evenings to save me a trip to the corner shop. While I’m not adverse to the odd Mars Bar, we can avoid making a habit of reaching for sugary snacks and fuelling the resulting hunger-famine energy crash cycle by filling our handbags/kit bags (and our bellies) with these quality, slow-release, recovery-boosting bites. All you need is a food processor (if you don’t have one, get one; I promise it will change your life). In 10 minutes flat you’ll have created 15 balls of hunger-busting bliss. Pulse the dates in your food processor until the mix is smooth. They may form one big ball – that’s normal due to their sticky texture. Add the oats, chocolate, chia, peanut butter, protein & coconut oil and pulse again for one minute, or until evenly mixed and the oats are in fine fragments. Roll into 1 inch balls. The texture should be sticky enough to hold all the ingredients together, but not wet enough to make your hands sticky. Refrigerate and tuck in when hunger strikes. They will keep for 2 weeks in the fridge. Mind you, it’s unlikely they’ll stick around that long. Need an excuse to eat more protein balls? Join me for any of my weekly classes, held privately or at Sweaty Betty Wimbledon and Paola’s Bodybarre Wimbledon. More information and timetable here.